This is the first installment of a multi-part post where I will describe my current workflow. This post explains why I made a brand new Photoshop Elements 13 Catalog and how I went about doing it. Future posts will cover the steps I take to manage my photos once they have been imported into the Organizer. 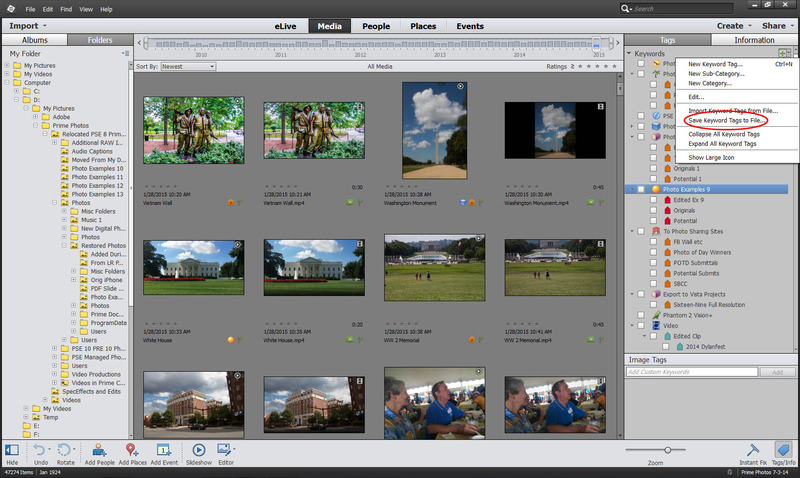 I have been using Photoshop Elements since Version 1, and managing my photo images using the Organizer since it was introduced in PSE 3 in 2004. I’m now using PSE 13 and PRE 13, Adobe’s consumer video editing program. During these ten-plus years, my workflow has changed as technology and the program have improved. When I first started using PSE 1 in 2001, I was shooting JPEG images taken with an Olympus C2000, 2-megapixel camera. For the past few years, I have been shooting RAW images. My new Canon 7D Mk II produces 20.2 megapixel images that consume over 25 Mb of disk space. A lot has changed over the years. The most recent and major change I have made affecting my workflow is I started a brand new Catalog this year, essentially retiring the one I begin with PSE 3. My PSE 3 Catalog had undergone many internal software changes by Adobe, as well as photo organization approaches I incorporated over the years. It currently has about 47K items. Don’t get me wrong. I did not scrap it. I just will not be adding new images to it moving forward. It and the memories it allows me to quickly access remain extremely important to me. About a year or so ago, it developed some internal problem or abnormality. 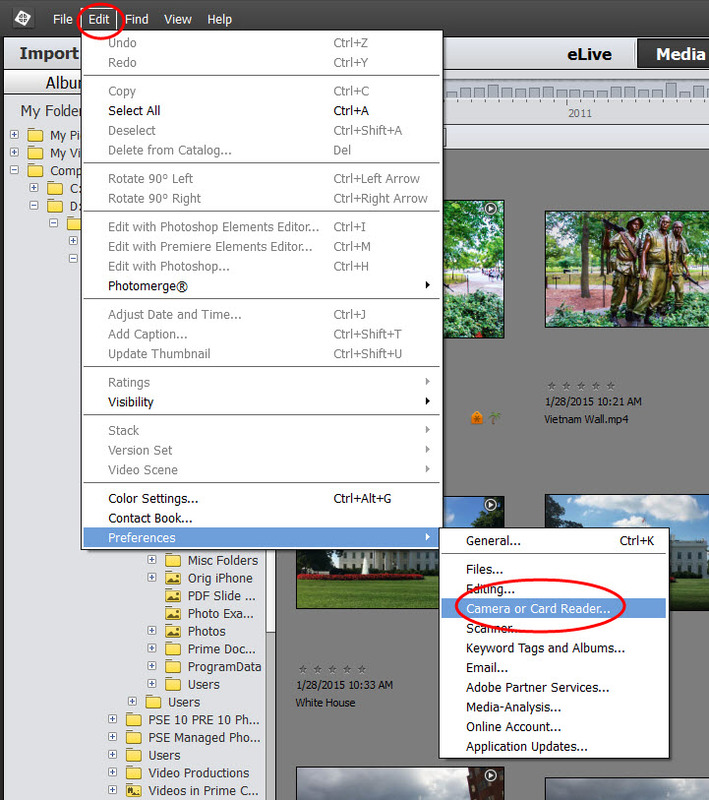 When I select a RAW image in the Organizer and then edit it in Adobe Camera RAW, upon returning, it takes over 30 seconds before the Organizer will respond to any mouse clicks or commands. A similar delay occurs when I return from editing a video in PRE 13. The problem surfaced during PSE 12 at some point. Over the months I tried several things to correct the problem, and have worked with Adobe as well during PSE beta testing. The Organizer works fine in all other respects. Due to its size, it does take about three hours and consumes almost 600 Gb of disk space when I do a full backup (File > Backup Catalog…). There was another reason that drove me to creating a brand new Catalog. The second internal drive that contains all of my photos is running out of space. True, I could simply begin storing new images on a second drive, but this would complicate my physical storage organization – more than it is now. The final factor that convinced me to create a brand new Catalog is that generally I work with pictures that I have taken relatively recently. If I want to work on a photo within my previous Catalog, I simply open it and do my work there (File > Manage Catalogs…). 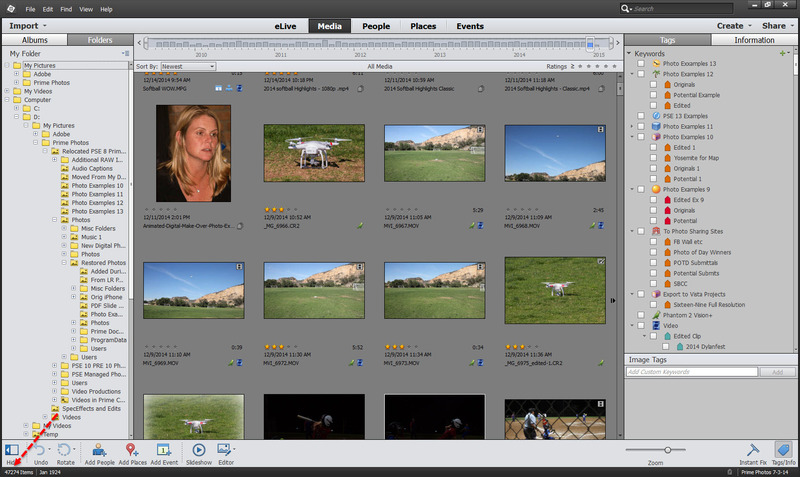 For those occasions when I need photos from both Catalogs, I’ll use either the Export or Move commands to bring my photos together, if need be. When I created my new Catalog, I wanted to retain my existing Keyword tag structure. The Organizer includes a couple of commands that facilitate this. To make my new Catalog took basically three steps, write my existing Tag structure to a text file, create a new empty Catalog, and then import the text file into my new Catalog. These basic steps are illustrated below. To the right of the green + sign opposite Keywords, click on the down arrow. 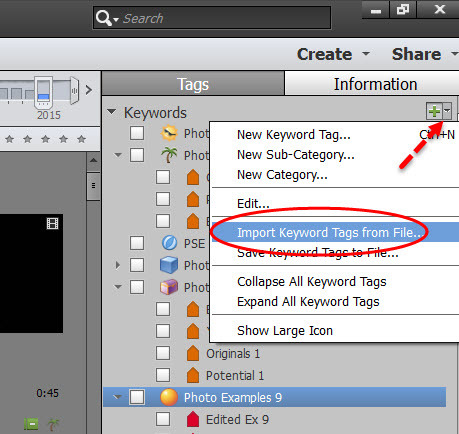 Select Save Keyword Tags to File and follow the screen prompts from there. 3. 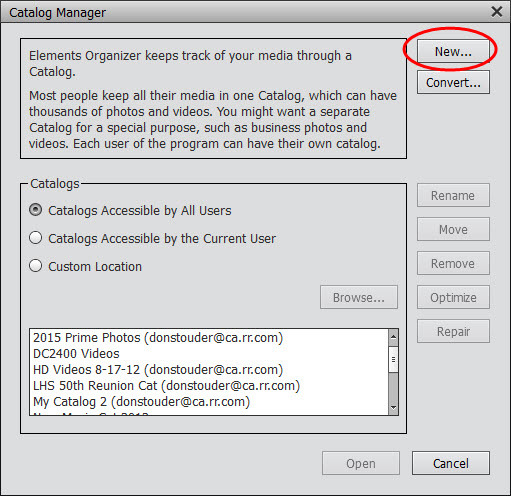 Create a new catalog by clicking on File > Manage Catalogs > New. Again follow the screen prompts. 4. From within the new empty Catalog, import the Keywords structure from the old Catalog by clicking on that same down arrow referred to in Step 1, and then selecting Import Keyword Tags From File. One of the benefits of creating a new Catalog was to clean up my physical folder structure. True, the Organizer could care less just how disorganized the folders are, but I still wanted take this opportunity to start right, since I was going to be storing my photos on a brand new external drive. In my case, I chose a portable, 2 Tb, USB 3.0 drive. Originally, I had started out with a reasonable folder structure for my old Catalog, but again over the years it had gotten less so as I migrated from PC to PC and versions of PSE. The figure below shows the basic layout of my folders. 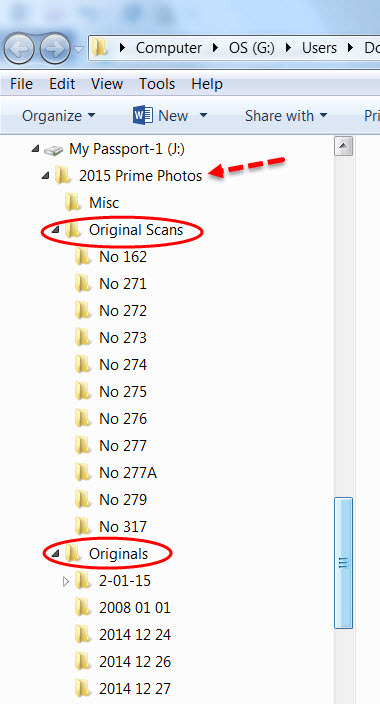 All of the items in my new Catalog (pictures, videos, and music) will be in the 2015 Prime Photos folder. Its two main sub-folders are Originals, where uploads from my camera reside, and Original Scans, where my scanned images from negatives and slides are imported. There is very little data stored elsewhere on this drive, so its 2 Tb capacity gives me plenty of room for growth – at least for now. Now I was ready to begin populating my new Catalog. I did have to change my Organizer preferences to automatically store the images from my camera to the appropriate folder, using Edit > Preferences as shown below. Well that pretty much concludes this installment. Next time, I will describe my workflow using this new Catalog. I more than welcome any comments, suggestions or questions you have. Until next time. Microsoft recently released Version 2 of their Image Composite Editor produced by their Research Labs. It free and fun to play with. Here is my first attempt at using this new version, which I uploaded to their Photosynth site for viewing. The file started with six photos I shot with my iPhone. Use the controls to zoom around the composite image. Spring registration for both the South Bay Adult School and the Torrance Adult School begins in a couple of weeks. The links below describe the classes I will be teaching at each of the schools. Remember to sign up early!